The 515 Omaha is a one piece aluminum stick with a balanced swing weight. We aren’t the only ones to have information about the 515 Omaha. Other places, in particular those who sell bats, usually have a boiler plate write up on the specs of a bat. Many of those we reference to make sure we are seeing what we should be. Here are some more references for the 2015 Louisville Slugger 515 Omaha review. We recommend this bat to hitters who consist of the following: Those who are on a budget but still want a name brand bat. Those who like the feel of one-piece aluminum bats. Those want something hot out of the wrapper. Those who would like a balanced swing. We would NOT recommend this bat to those hitters who consist of the following: Those who want a composite or two piece bat. Those who want a higher MOI swing. 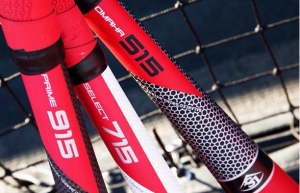 Compared to the 915 Prime and the 715 Select the 515 Omaha does have a lighter swing. When we measured it was a good 10% lighter. Slugger resurrected the Omaha name after a year in hiatus to take on the full aluminum line in the top shelf series of bats. The 515 ST+20 alloy is a know commodity that is durable and has good pop out of the wrapper. We suspect the 515, with its affordable price point, will be the best selling bat in the Slugger series this year. While the world waits for DeMarini’s new CF7 and Voodoo FT to be released, the 2015 DeMarini NVS Vexxum is also in lift off mode. The Omaha, if I have counted right, has the most robust sizing options of any bat in the line (and maybe in the entire market). The BBCOR line has 7 different lengths. There is a 2 3/4 with a drop 10 in 7 lengths. A 2 5/8 barrel in a drop 10 and drop 5 with a number of lengths and a 2 1/4 with a several lengths as well.